For 6 years, Cranbeary and Lee have lived together at the Denver Zoo, and by the looks of it, the two have gotten quite close. Unfortunately, the two are about to ripped apart — and even worse, the two are destined for more time in captivity. The Denver Zoo plans to send Cranbeary to the Alaska Zoo and Lee to the Columbus Zoo and Aquarium in Ohio. Please sign this petition demanding that the Denver Zoo keep Cranbeary and Lee together and send them to a sanctuary instead! Polar bears were born to live a certain way and to withstand certain conditions in the Arctic, their natural habitat. They are built to roam and forage for food and are capable of surviving extreme cold, diseases, and competition with rivals — but in captivity, all those natural instincts are suppressed. That's why animals in captivity, including polar bears, often suffer "zoochosis," a condition where animals exhibit stress by pacing, swaying, rocking, and other unnatural repetitive behaviors. While Cranbeary is at least being sent to Alaska where polar bears are actually found naturally, she will still be held in captivity, living a sad, stressful life, thousands of miles away from her friend, Lee. Cranbeary and Lee deserve a better life. 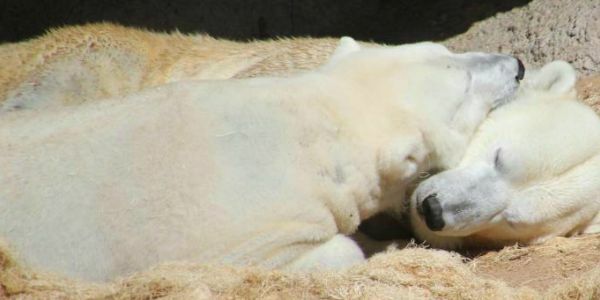 Sign now and demand that the Denver Zoo keep these bears together and send them to a sanctuary.